This 55" 55EX640 replaces the 55EX620 from last year as one of Sony's hot selling mid-range TV models. It's got Sony's next to best picture video engine so it will not have as superb a picture quality as the HX929 for instance. The screen does not have the superior louvering feature that helps with anti glare properties either so it will shed some glare from in room lighting. Nevertheless, for the price point it has lots of features with full web browsing, and Sony's Internet suite called Bravia Internet Video. As well there is the Rovi Online Guide. One thing to know about black levels on this TV is that they appear very inky and deep on the top and bottom bars in a 16:9 format mode but can be a little more washed out on the picture itself. This is also in part to the anti reflective coating on the screen, though we appreciate their depth on the bars which helps add contrast to the entire picture. Sometimes dark shadow detail is a bit lacking in the KDL55EX640 as the screen filter (matte screen) on this TV causes a hazy appearance with some programming on the screen. One remedy to this problem is turning up the Brightness setting some. This will cause better definition in dark areas, but a less penetrating black level and contrast. The inbuilt Ambient light sensor is there for your use if you want it but may be turned off through the menu system. It introduces a slight amount of flicker that the most pure picture hearted will not want to tolerate. This gray scale ramp shown from a side viewing angle shows how colors are affected and distorted from the sides of the EX640. Note the additional color added to grays. The Motionflow does do a good job in fast action scenes of reducing jerkiness and smoothing out images, but it has its negative side as well as it clarifies the background too much and takes out artistic blur with film based movie material. Aside from that, it is great with sports and other fast action. The remote control is very clean and organized with a matte finish to prevent finger prints. There are optimal keys for netlinx and other prominent necessary keys. With the 55" inch version of this TV model we were surprised to review the 15W X 15W speakers – which is bigger than most still have a lack of the voice function quality and definition. I like the new “perforated” design for this TV. It has a one inch framing bezel that is rounded to prevent glare and overall the TV looks very classy. Overall, I was not incredibly impressed by the SEN. Internet choices are fairly easy to access and include Netflix®, Pandora®, HuluPlus™, Amazon Instant Video, YouTube™, Slacker® Internet Radio, Crackle and social networking through Facebook and Twitter as well as others. Sony claims Yahoo! Broadcast Interactivity Widgets as well. This new platform allows one-click access to TV Apps which are related to the content you are watching on the TV. In other words, it's a convenient way for Sony to market their Apps to you if you are so inclined to use the feature. On the other hand, it does make it easy for you to know which Apps you might like. As far as additional and free Apps goes I really did not see a lot of value. See our full review of the SEN. The speakers in the Sony KDL-55EX640 do a reasonably good job with plenty of treble and volume although it gets a bit muddy with some DVDs at higher volume. 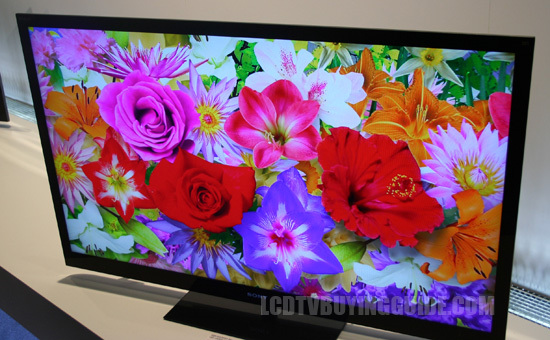 At $1400 the price of the KDL-55EX640 is in line with other mid-tier LED-LCD TVs. A good comp is the Samsung UN55ES6100, the LG 55LM6200 is similar. The Sony KDL55EX640 sells for a $100 discount to these two models. The Toshiba 55L6200U is also in the ballpark though more. Sony for once it seems Sony leads the major manufacturers in a Television in terms of price. I wont get into plasma TV value here.